UNAVCO proposals, workshop publications and reports, periodic organizational reports, and brochures. 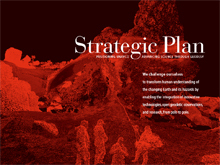 Read the UNAVCO Community's 2012 report A Foundation for Innovation: Grand Challenges in Geodesy. This report summarizes that work and identifies the key areas where additional research is needed to further our understanding of dynamic systems within the solid Earth, atmosphere, cryosphere, and hydrosphere. The UNAVCO Strategic Plan - 2016-2020 provides a foundation for an implementation plan that will detail actions, time lines, and specific metrics, and will be undertaken through UNAVCO governance, by the investigator community, and by UNAVCO staff. See UNAVCO's submitted Proposals that have been funded. Reports to Sponsors include current and past grant reports to our sponsors as part of our responsibilities for continued funding. Meeting & Event Publications include presentations, publications, and posters from UNAVCO workshops, and other community meetings such as AGU Fall and Spring Meetings. Papers include white papers, position papers, etc.